Wilshire Lakes Homes: Enjoy the pristine and immaculate lifestyle in this bright elegant model Estate Home with BRAND NEW UPGRADES of over $125,000 consisting of 5 bedrooms, 3 bathrooms, great living space. A DREAM HOME sold TURNKEY! The perfectly fine-tuned Living Room overlooks the private NEW screened lanai and pool area on a beautiful lake setting with water feature great for entertaining or family gatherings. The outside area is spacious beyond your imagination and if that is not enough, feel free to enjoy the community facilities boasting pool, spa and fitness. The Master Suite Opens directly to the lanai and is equipped with walk in custom cabinet closets, oversized jetted tub, separate huge walk-in shower and His & Hers Vanities with seating area. The UPGRADES include: BRAND NEW ROOF, A/C, TILE FLOOR on the diagonal, WATER HEATER, STAINLESS STEEL REFRIGERATOR, DISHWASHER, WASHING MACHINE, SOFFITS, FASCIA BOARDS, 7inch GUTTERS, PAINT and LANAI SCREENS! You are getting a 2003 built house which is completely renovated at an unbeatable price! Wilshire Lakes is in a prime location very close to beaches, supermarkets, shopping, restaurants and Nightlife such as Mercato. FREE 1 year Home Warranty! Wilshire Lakes Homes: Come and see this beautiful single family home on an over-sized lot. Boasting an open floor plan, complete with splendid high ceilings and an abundance of light through it’s large windows, this property is not one to overlook. The backyard is handsomely gardened with an outdoor kitchen with grill. The beautiful screened lanai with pool provides a perfect setting for entertaining. This home is ideal for a family as it is conveniently placed near "A" rated schools, local shops and community har-tru tennis courts. This home boasts four bedrooms, one of which is well-suited to be converted into a home office. The master bedroom is exceptionally large including two walk-in closets. Enjoy all the amenities of Wilshire Lakes in this desirable North Naples community. Wilshire Lakes Homes: You will love this charming 3 BDRM + DEN/ 3 1/2 BATH abode with fabulous heated pool & spa and spacious lanai overlooking scenic lake. This light & bright, professionally decorated, beautiful home contains many custom upgrades: Decorative Copper/trey ceilings; high ceilings throughout; solid ash kitchen cabinets; negative edge bow window in morning room overlooking pool; study w/oak floor; tile on diagonal, plantation shutters and custom window treatments; separate A/C in garage; built-in gas grill & sink on large lanai. Decorator Furnishings Included! Excellent Condition! Move-in Ready! Shows Well! Wilshire Lakes offers 24/7 guarded gate access; plus, a clubhouse, heated community pool, lighted tennis courts, exercize room, sidewalks, walking trails and more. Super, central location in north Naples close to Mercato, Waterside Shops, Venetian Village; fine dining, shopping, entertainment and white sandy beaches! Wilshire Lakes Homes: IDEAL HOME IN THE FAMILY / PET FRIENDLY COMMUNITY OF WILSHIRE LAKES. 3 spacious bedrooms and a study, 3 full baths and a fabulous media room complete with wet bar and custom built-in shelving for entertaining at the rear of this home. Beautiful wood flooring in every bedroom and tile floors throughout. The kitchen with its culinary island offers an in-wall microwave/oven, loads of cabinet space and granite counters. Enjoy those holiday dinners in the dining room or grab a casual bite in the breakfast nook overlooking the screened-in pool/lanai and private preserve view. Step outside the media room into an open-air retreat under roof. Wilshire Lakes offers 24/7 guarded gate access, a fitness center, lighted Har-Tru tennis courts, geothermal heated pool and much more. Enjoy this homes warmth and charm which is just moments away from Naples renowned white sandy beaches and upscale shopping and dining. Wilshire Lakes Homes: H.14437 You want a retreat that is surrounded by space with no homes across the street and a quiet surreal pond in the back that will allow the suns reflection off the water to fill your home with amazing light. You want an extra large lanai where you can entertain and enjoy your pool without being able to see your neighbor's newspaper. If you want luxury then you must come see this 3 bedroom plus den or 4th bedroom (has a closet), 3 full bath home situated close to Livingston Rd and Vanderbilt Beach Rd less than 5 miles to the beach. It already has a 3 car garage (not a golf cart 3rd car, a real 3rd car! ), new AC's both installed in the last year, new water heater (just installed), and 12' high ceilings adorned with wide crown molding throughout whole home! Granite counters, quality cabinetry adorn this popular design. The zero corner sliding doors in the family room open to extend indoor living to the lanai. Hard to find this quality in today's production new construction homes. Come see the difference and schedule your private showing. Wilshire Lakes Homes: Great curb appeal on this Rutenberg 4BR+ Den floor plan with almost 100 feet of southern exposure on the lake! A large covered entry porch leads into an immediate view of sparkling water which is enjoyed from all the main rooms. Many custom floor to ceiling windows, arched transom windows, architectural ceiling cut-out details and light colors add up to a bright, cheerful ambience throughout. This extremely popular floor plan with separate expanded MBR suite with lanai access; a set of Jack & Jill bedrooms sharing a full bathroom; a 4th bedroom or cabana with walk-thru bathroom to the back yard or future pool and French doors to private den. Both formal and informal dining and living areas, a nice size laundry room and an oversize 2.5 car garage for storage or hobbies. Other features include a fireplace in the family room, crown molding, plantation shutters and light neutral tile with beautiful mature tropical vegetation. Brand new roof in October 2018. Pride of ownership is evident throughout this immaculate one-owner home! Wilshire Lakes Homes: WELL MAINTAINED 3 BEDROOM PLUS DEN WITH LAKE VIEWS. SPACIOUS HOME, SPLIT FLOOR PLAN WITH MANY UPGRADES. CUSTOM KITCHEN WITH WOOD CABINETS. TILED LIVING AREA. PAVER DRIVE WAY AND LANAI 3 CAR GARAGE. MUST SEE!!! Wilshire Lakes Homes: Enjoy the absolutely stunning expansive southern lakefront view upon entering this estate home. A comfortable floor plan for relaxation and entertainment. The home offers 3 Bedrooms + Study and 3 Bathrooms, including a Master Suite with a walk-in closet and en-suite bath with separate tub and shower. The split floor plan is ideal for families and friends who enjoy their peace and quiet. The chef's kitchen features stainless steel appliances, breakfast bar and center island providing ample prep space to prepare your culinary delights. The simple attention to details such as tile flooring on the diagonal and granite counters in the bathrooms add a nice touch. The spacious covered lanai with its solar heated pool offers plenty of room for sun worshippers and grilling experts. This wonderful community offers 24/7 guarded gate access, a fitness center, lighted Har-Tru tennis courts, geothermal heated pool and much more. Enjoy this home's warmth and charm which is just moments away from Naples renowned white sandy beaches and upscale shopping and dining. Wilshire Lakes Homes: H.13934 - BRAND NEW TILE ROOF! New “picture frame” screen pool cage, new pool heater, new rear sliding doors, new front entry door, all in 2018. Super popular floor plan for its efficient use of space! This fabulous single family pool home offers 3 bedrooms plus den with built-in home office wall unit and 2 car side entry garage. Open great room floor plan with renovated kitchen boasts newer granite and stainless appliances including a deluxe double oven. Enjoy the large lakefront pool with pool bath and expanded lanai with spectacular, highly desired southeastern views overlooking the lake. Windows everywhere with a light, casual, open floor plan, volume ceilings, custom lighting throughout. Built-in entertainment center in great room. Well irrigation, so no water bills to keep your lawn and landscape looking beautiful. Excellent North Naples location with top rated schools, close to shopping, restaurants, and only 3 miles to world class Naples beaches. One-year free pool cleaning service with an accepted offer. Wilshire Lakes Homes: Now Available! 3 bedroom 2 bath home in sought after North Naples Gated Community. Features, formal dining room, wood flooring throughout the home, newer A/C, newer washer and dryer, paver drive, tile roof, & tropical landscaping. Enjoy the elegant master bath w/separate tub, walk in shower, marble flooring, dual vanities, and walk-in closets. The formal dining room is just steps away from your gourmet kitchen featuring, granite, custom wood cabinets, & stainless steel appliances. The kitchen overlooks an extra large Great Room with French doors that offer views of the private lushly landscaped backyard. The screened in lanai opens the home up to the lanai, bringing the outside in and the inside out, providing a great setting for entertaining. Zoned to A rated schools, Vineyards Elementary, North Naples Middle, & Barron G Collier High School. Close to shopping, restaurants, Vanderbilt Beach, and the Mercato anchored by Whole Foods & Silverspot, 18 restaurants, over 20 upscale retailers. The Mercato hosts a vibrant year-round event calendar open to the public. HOA fee includes, lawn, community pool, tennis, fitness room. Wilshire Lakes Homes: Former Rutenberg Model "Aspen II" floorplan with 3 bedrooms, 2 baths, 2 car garage, south facing/extended screened lanai on a lushly landscaped corner lot in prestigious WILSHIRE LAKES COMMUNITY. This immaculate home boasts an open floor plan, freshly painted interior, designer window treatments, crown molding, large walk-in closet w/built-ins in the master bedroom, warm wood cabinetry in kitchen with plenty of storage & a breakfast room, separate laundry room, and A NEW ROOF IS BEING INSTALLED!!! A rated schools: Vineyards Elementary, North Naples Middle, & Barron Collier High School. Close to shopping, restaurants, Vanderbilt Beach (only 15 minutes to sink your toes into the sugar sand beach), North Collier Regional Park, and the Mercato Shopping Center anchored by Whole Foods & Silverspot Movie theatre and plenty of restaurants. This active community has low HOA fees which includes: lawn maintenance, 2 large community pools, community room, tennis, and fitness room. A Premier Gated community with 24 hour manned guard gate and lushly landscaped entrance into and throughout the community. A place you will be proud to call your "home" or "home away from home". Priced to sell! 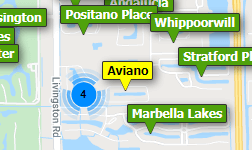 Need professional assistance selling your property at Wilshire Lakes Naples? Find out how an Area Specialist can help to generate more property exposure in order to get the most money for your investment in the least amount of time.